The promise to pay benefits by highly rated US Legal Reserve Life Insurance Companies is the mechanism that backs the Senior Life Settlement asset class. 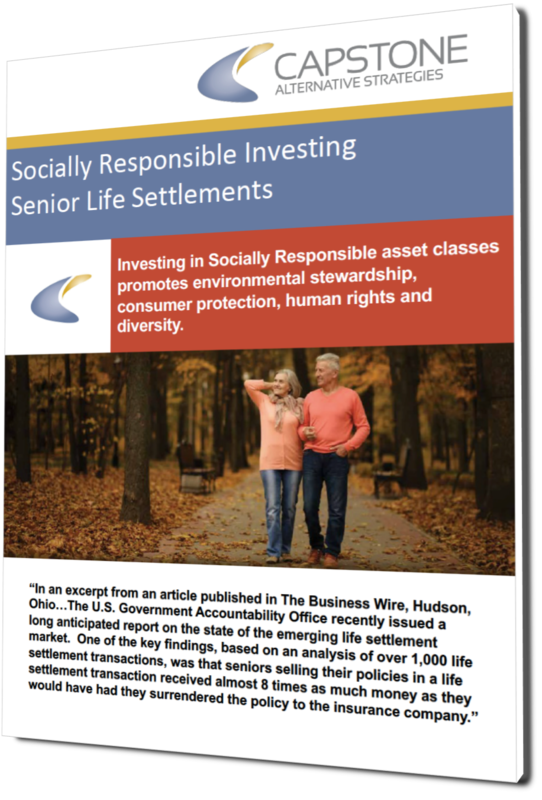 A Senior Life Settlement is a socially responsible transaction that benefits seniors. When a senior insured decides, “I want to sell my life insurance policy,” it is well-documented that the seller will receive a significantly greater amount by selling their policy to a life settlement company than they will to surrender it back to the carrier, or worse…stop paying the premiums and let the policy lapse worthless. Senior Life Settlements benefit investors because they have a known cost and a known yield. Capstone’s proprietary Premium Reserve Management (PRM) System mitigates the risk of premium calls due to extended longevity by ensuring policy premiums are paid and the life insurance contracts remain in good standing. The Senior Life Settlement asset class creates many additional advantages for investors as well. The unique characteristics and tangible advantages of the Senior Life Settlement alternative asset class are largely unknown and often misunderstood by both advisors and accredited investors. It is illegal for someone to own a life insurance policy on an individual with whom they have no insurable interest. Legal opinions have found that the beneficial interest in an insurance policy can be legally transferred to a non-related individual. In the 1911 landmark case of Grigsby vs. Russell, US Supreme Court Chief Justice Oliver Wendell Holmes enacted law that life insurance is an asset, transferable at the will of the owner. Insurable interest is only a concern at original issue between the carrier and the insured. Purchasing the beneficial interest in a policy is taking advantage of seniors. Purchasing the beneficial interest in a policy can provide seniors with a significant cash inflow and the amount paid is typically far greater than the cash surrender value of selling their policy back to their carrier. A Senior Life Settlement transaction originates because the insured either no longer needs, wants or can afford their coverage and is in peril of their contract lapsing due to non-payment of premiums or has sought a surrender offer from the carrier. The Life Settlement industry exists because interested parties bid to purchase insured’s contracts at a price higher than a carrier’s surrender offer but less than the face amount. The Government Accountability Office (GAO) published a study that reports seniors can expect to receive an amount significantly greater than the surrender values offered by the carriers in the Life Settlement market. Several states mandate to insurance companies operating in those states that they must make those insureds at risk of lapse or seeking a surrender offer that a secondary market exists for the sale of their coverage. In some cases, seniors seek liquidity from this hidden asset, disguised as a liability, to defray the high cost of health care or simply to just improve the quality of their financial lives. This product takes advantage of terminally ill people who are desperate for funds. A Viatical Settlement by definition is the sale of insured’s coverage that is terminally ill and has a life expectancy of twenty-four (24) months or less. Capstone does not participate in any manner in the viatical market. A Senior Life Settlement is a very risky product. This is one of the few investments where the purchaser knows in advance what the overall yield is going to be. The primary uncertainties are the time to policy/portfolio maturity and the need to create liquidity from other sources of capital. Capstone utilizes three independently produced life expectancy appraisals from medical underwriting companies to project the expected life span of an insured. The average life expectancy assessment projects the Senior Life Settlement purchaser’s expected holding period to policy maturity. Note, the life expectancy assessment is not guaranteed as exact human mortality cannot be accurately calculated. The supposition presented by the medical underwriters are based on large sample sizes of medical data and the specific health impairments of the insured. Senior Life Settlements are too complicated for my clients. While the mechanics of this investment are complex, and such investments are only available to accredited investors, they function very much like a zero-coupon bond, a concept with which many investors are familiar. In simplest terms, an investor is a buying a dollar at a steep discount that they will receive in the future. The Senior Life Settlement market often subjects investors to additional premium calls to meet ongoing premium demands due to extended longevity. Capstone is very conservative in its estimates of life expectancies and has developed a unique method of projecting against the potential for premium calls with its proprietary Premium Reserve Management (PRM) System. How everything works and the fee structure is just too confusing. Capstone believes in making hard, easy. The transparency of the process and the fact that Capstone has simplified the investment so that it has a known cost and a known yield in advance, takes the guess work out of the equation. Capstone seeks to provide immersive education and understanding of the Senior Life Settlement asset class that results in a value-added relationship between Capstone, the advisor and their clients. Want to learn more about investing in a socially responsible way? Download our free brochure today!